In the animal kingdom, there exists a wide spectrum of animals, land, sea and air borne animals. One rather interesting character trait that I observed over a range of animals is that certain animals were fond of hunting alone, while some were more comfortable by hunting in packs or groups. This character trait observed in these animals are specific and are only belonging to a certain number of animals, especially those that live in the plainlands or have natural instincts of less interaction with others of their breed. Certain animals such as the tiger are what we term a ‘concealment and ambush hunters’, carefully stalking prey, circling in as closely as possible, and then suddenly charging the target from behind. Leopards and Cheetahs have similar tendencies, and usually hunt alone, relying on their ability to mask themselves from their prey and stalk their prey, going in for the kill when the prey least expects it. This can be observed in the two videos below where we observe the tiger carefully stalking its prey and going in for kill when the prey least expects it. In the other video, we see the cheetah slowly and carefully stalking the gazelle, making its move as per the gazelle’s move and then rushing in to attack with its cubs following once the mother has wounded the animal and prevented it from running away. I believe that the reasoning behind hunting in a pack also bears co-relation to the size of the animal involved as it is observed that animals which are larger is relation to the smaller ones, such as the wolves or the hyenas tend to stick together for strength rather than the tiger or leopard whom are capable of hunting on their own without any help from the rest of their pack. This dependence shows us the relationship animals have with each other with regards to their survival. A simple choice of “Silent and Solo” shown by the tigers and leopards or “United We Rise! !” as the hyenas and wolves demonstrate to us! But then again, as long as the stomach gets filled, anything goes.. Rescue mission or deliberate murder? Being a gigantic land mammal and well-known for its trumpetting sounds, elephants can hardly go unnoticed by one! They fall under the Elephantidae family and mainly in the Elephas and Loxodonta generas. There are only 3 species of elephants living today: the African Bush Elephant (Loxodonta Africana), the African Forest Elephant (Loxodonta cyclotis) and the Asian Elephant (Elephas maximus). All other species and genera of Elephantidae are sadly extinct. 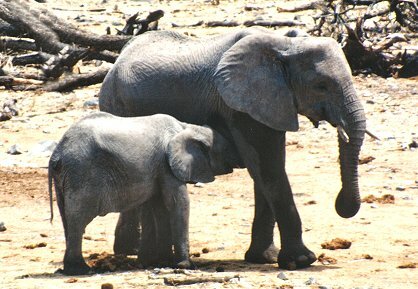 Elephants therefore may face extinction in the future. The gestation period of an elephant can range up to 22 months and this makes every pregnancy vital in the conservation of the elephant species. Ironically, this anxiety can be observed in elephant mothers as well! These mothers exhibit astonishing behavioural traits of kicking their new born violently till it is able to respond and stand. This has also been proven effective in saving still born babies and reviving them. The video link below illustrates this barbaric but extraordinary behaviour! A mild warning that this is not for the weak-hearted. However, these amazing mothers have also been reported by BBC to have killed some of their young through this same gesture, a trend observed mainly in captive elephants. Experts like Mr Redmond believe that this could be because captive elephants have no one to comfort and help them through their birth unlike elephants in the wild that usually have fellow female elephants that accompany them through the process. Perhaps, this is why people lend a hand in zoos during the birth of their elephants! It has also been alternatively theorized that these elephants kill off their young intentionally due to the torturous ‘concretized conditions’ that they have to live in. Thus, till today, it is uncertain as to why elephant mothers behave in a brutal manner upon giving birth as various factors can be at play. Although this act can either save or kill new born elephants, it is an extraordinary behavioural trait that is yet to be studied deeply on! Meanwhile, it is up to us to decide if this is an act in a rescue mission or a mother’s deliberate murder! “Allomothering among African elephants” – Volume 35, Issue 1, P C Lee, Elsevier Ltd, 01 February 1987. (Accessed on 5 April 2010). Giraffes (Giraffidae Giraffa camelopardalis) are known to be the tallest animal in the world, with distinct long necks and long grasping tongues that can extend up to 18 inches to munch on the inner leaves of trees. However, did you know that early age giraffes were more deer life with shorter necks? Then how did the Giraffe species end up with long necks? It is a common belief that giraffes had adapted longer necks as part of a survival technique to reach out to the greater heights for food. However scientific research in the 1990s show that when food was scarce giraffes preferred feeding in lower bushes than in tall trees.Thus dispproving the common belief. There are other speculations that the giraffes have long necks in order to help them identify predators from afar. However, biologists are not convinced by this being the solitary theory behind the evolution of giraffes citing that if seeing far distances was such a huge advantage then other animals would have followed the giraffe’s evolution. There was a more concrete evidence and reasoning behind this evolution: Necking. Simmons and Scheepers found that the longer and more massive a giraffe male’s neck was, the more likely he was to win the mating contest and thus, giving him more chance of mating and this led to the “longer” neck genes being passed down more frequently to the future generations. 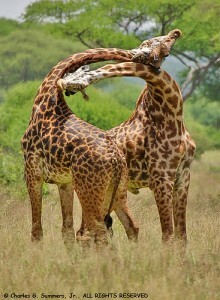 This mating competition is believed to have further motivated the evolution of the giraffe’s neck as the longer-necked animals were more successful at reproducing.